The project locates in Hainan Shenzhou Peninsula, with a typical tropical climate. Its 8 plots extended along the interface between the mountain and the sea, forming a linear belt with extremely rich landscape and topographical conditions. Drastic elevation changes (39m total in the whole site) together with the presence of high-rise housing towers generate very different viewing conditions towards the sea and thus highly varied land values. How to manipulate the building masses to maximize the overall views towards the sea was one of the main challenges of this project. 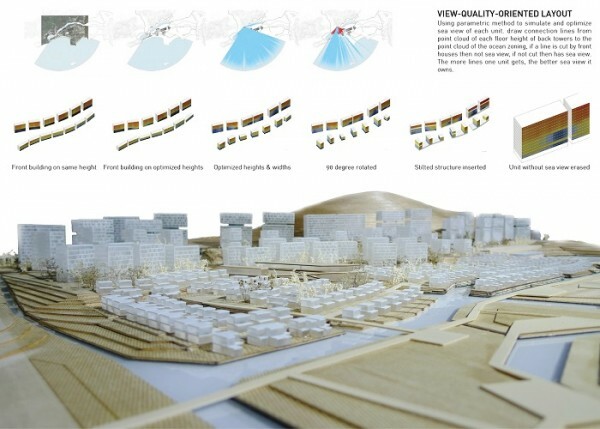 Based on a careful reading of the site morphology as well as the ecological conditions of its larger territory, our scheme proposes a series of ecological strategies that take advantage of the development as an opportunity to enhance local ecosystems. For example, we aimed at recovering the mangrove habitat, which has been heavily damaged in the last decades, as a crucial resource for biodiversity. 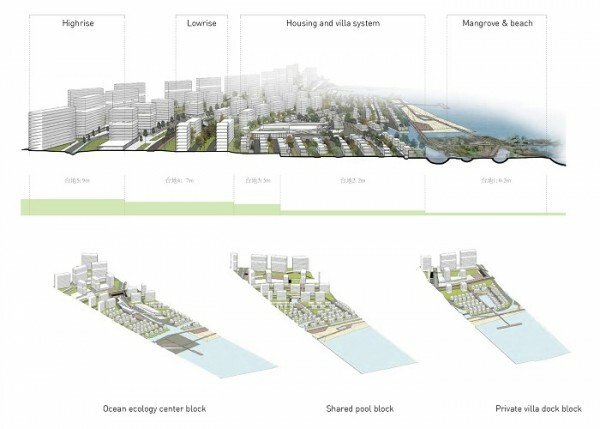 Planting mangroves is also a natural mechanism for flood mitigation that allows a more intimate and shallow seashore rather than the construction of concrete seawalls. 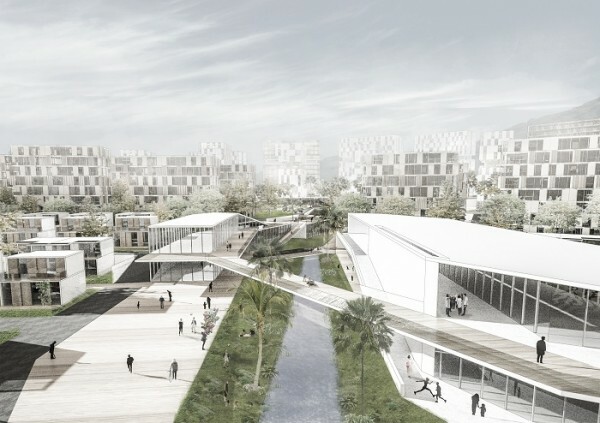 Also, a multi-layered stormwater management system is designed as part of the green infrastructure, making it a low-impact development which will be an important demonstration of the application of the spongy city principle to a dense housing neighborhood. 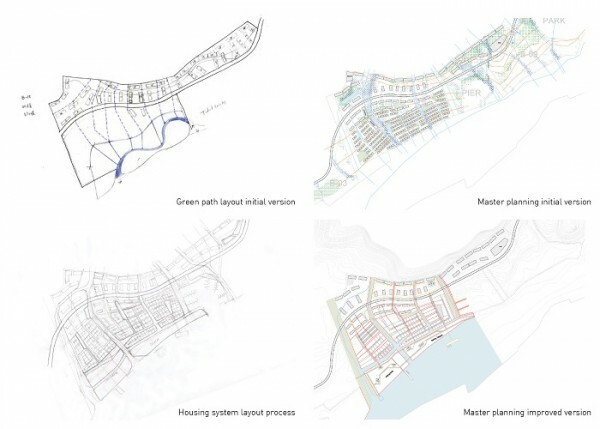 A number of green corridors are proposed according to the analysis of the surface runoff, forming an efficient water discharge framework with the minimum earthwork needed. 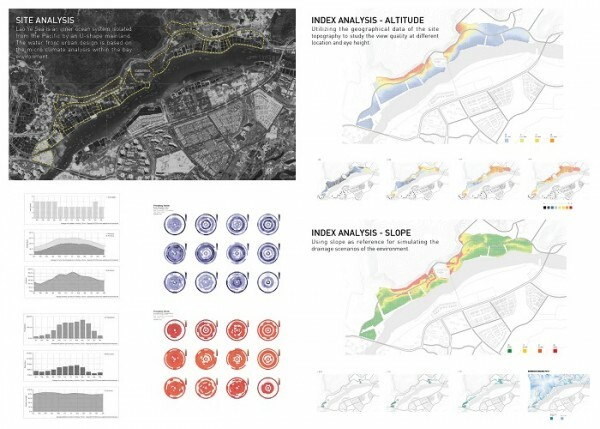 Parametric tools are applied at this step to spot out areas with the most concentrated runoff, the least sea views, the best original land covers as well as the poorest storm water drainage. These series of locations are the best places to locate the green corridors, whose sizes are determined according to the amount of runoff naturally converging due to the geometric configuration of the topography. The general site mesh is structured by a series of control curves as road axes coming from simplified contours (parallel to the seashore) and the green corridors as main pedestrian axes connecting the mountain to the sea (perpendicular to the seashore). The green corridors become navigation channels that allow sailing boats to explore deeper inland, extending the active length of the shoreline. The wetlands located along the green corridors are storm water treatment devices that clean the water runoff in the process of draining towards the estuary, improving over time the water quality of the lagoon.